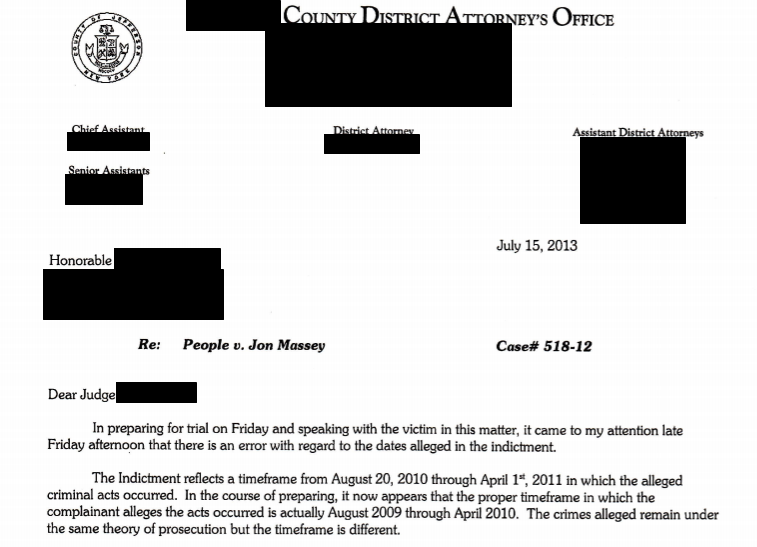 The first ADA (Assistant District Attorney) involved in the Jon Massey case was a go-getter. He had a shining career in prosecuting sexual offenses against minors that was the subject of a very favorable interview in the local newspaper. The article even documents the inter-agency cooperation between CPS and the District Attorney's office, as it details the use of the Child Advocacy Center - a location used by CPS for interviewing children (and it was used to interview Ruby in the Massey case). But there was an undercurrent swirling around the ADA. First were the issues involving the first grand jury that heard the Massey case. Leading up to that grand jury, we have documentation that numerous affidavits and other evidence were sent to the ADA that would cast substantial doubt on Ruby's story, yet he proceeded forward regardless. There is documentation that this first ADA spent at least two 3-hour sessions with Ruby reviewing her story and working on her testimony before the first Grand Jury, as well as the hours of time spent with other experts and prosecutorial parties - see Numbers Don't Lie! However the first ADA assigned to the case did a major crash and burn, and left his position at the DA's office in March 2013. The next ADA filed a motion in the case that definitively states that Ruby's story had been checked and verified as being as accurate and as complete as possible. This would make sense - there were well over 34 documented hours of interviews regarding time, place, and events that occurred with Ruby. The new ADA had access to all of the files and records in the case and so would have been confident of these details enough to put her name to a sworn statement. Additionally, the second ADA directly witnessed the testimony of the psychologist that was paid by the county to do an evaluation of Ruby, she herself called him as a witness and did the direct examination of this expert. So when she presented the letter below to the judge four days after the hearing ended, it was blatantly disingenuous. It must be very gratifying to work for the DA's office in our county - you can be incompetent, ineffective, and inept, and still collect a regular paycheck. As taxpayers, we definitely are NOT getting our money's worth!